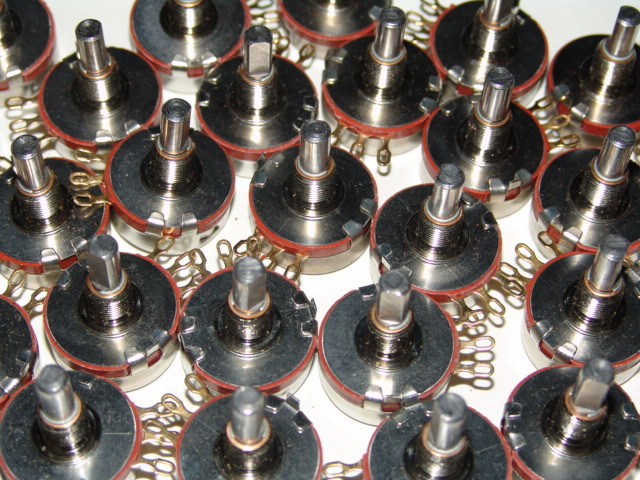 Rotary Potentiometers (also called knobs, pots or twiddletits) are variable resistors. That means that unlike ordinary resistors, their reistance (measured in ohm) can be controlled by turning the shaft clockwise or counterclockwise. This is almost exactly enalogous to the faucet over the sink in the bathroom. You turn the faucet to change the resistance and allow more or less water/electricity to flow through. Potentiometers have their values printed on them. A 1M potemtiometer has a maximum resistance of 1 megaohm and a minimum resistance of 0 ohm. When we twist the shaft we are moving the “slider” (also called wiper) back and forth across a resistor. Effectively selecting how much resistance we want between pins 1 and 2, and also how much resistance we want between 2 and 3. There will allways be a maximum resistance between pin 1 and pin 3, so e.g. in a 1M potentiometer, there will allways be 1 megaohm between pin 1 and pin 3. As we twist the shaft clockwise, we are increasing the resistance between 1 and 2, while also decreasing the resistance between 2 and 3. In addition to a maximum resistance value there is usually an “A” or a “B” printed on the potentiometer. This is to signify whether it has a linear or a logarithmic taper. -“B” is the most common type and stands for “linear taper”. This means that the reistance will increase evenly and constantly as we torn the shaft from one side to the other. -“A” stands for logarithmic or “audio” taper. In this potentiometer, the resistance will increase logarithmically as the shaft is turned. 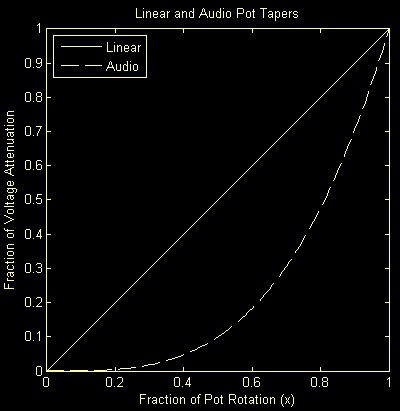 The reason this is often called audio taper is because our ears hear volume logarithmically and so this kind of volume controll sounds more correct to us. Here is an image that illustrates the difference between linear and logarithmic potentiometers. Sliding potentiometer fungerer på akkurat samme måte som såkalte rotary (roterende) potensiometer, forskjellen er ati stedet for at carbon sporet (i carbon trail potmeter, den vanligste typen) er buet slik vist i bildet http://www.captaincredible.com/abc/wp-content/uploads/2010/09/x-section.jpeg, så er sporet rett. Så de to gjør akkurat samme sak, men er utformet litt forskjellig. Hvilke ben som går hvor på en sliding potentiometer kan i midlertid variere litt, her kan man se hva fabrikanten/leverandøren sier, eller bare prøve seg fram.